I was a very literal child. When I was hospitalized at age 4 for a routine tonsillectomy, the evening before the surgery my Mother said she and my Dad were going to get a bite to eat, and that they’d be right back. “Are you sure it’s just a bite?” I asked. That seemed unlikely to me, since I would have had a very hard time eating just one bite. I must have furrowed my brows in that way I do when something seems odd. “Oh yes, she said. “Just a bite.” When they didn’t come back as quickly as I thought they would, I asked the nurse where they were. She explained that it took a while to eat dinner, and then they would be back. “Oh no,” I said. “I asked her how many bites and she said just one.” I couldn’t yet understand what “it’s just an expression,” means. I can still feel my puzzlement at why in the world someone would say “just one bite” if they were going to have more than one bite, and how these grown-ups didn’t seem to notice the inaccuracy in what they were saying. Sometimes I’m still a little like that four year old I once was. That’s why, when I first started eating this way, and had taken Dr. Swank’s The Multiple Sclerosis Diet Book out of the library, I was overjoyed to discover literal “translations” of grams of fat into usable amounts like teaspoons or tablespoons, and how many teaspoons of nuts or seeds is equivalent to a teaspoon of oil. But even in that list, Dr. Swank resorted to the mysterious nomenclature of ounces. One third of an ounce of walnuts equaled 5 grams of fat. And once I got introduced to the low fat plant-based community of doctors and dietitians, they tend to talk –or argue–about fat in ounces. Or that vague doctor-speak, “acceptable in small amounts.” In my reading of The Pleasure Trap, I got the impression the doctors at True North might favor avocado over nuts. Dr. McDougall refers to nuts as a delicacy and discusses them by the ounce in this newsletter article. While he recommends no nuts for patients with heart disease, even Dr. Esselstyn recommends 1-2 tablespoons of flax meal a day. And even Jeff Novick has a tahini dressing in one of the simple meals on his facebook page. So I got curious. And got myself a food scale, which can be had for around 5 bucks at the likes of Bed, Bath and Beyond. And I measured two generously filled tablespoons of ground golden flax into my food scale and guess what—they weigh just under an ounce on my scale. 3 tablespoons is just over an ounce. Part of the driving force behind my curiosity is that when I finally got around to reading Eat to Live a few months ago, I noticed that Dr. Fuhrman recommends an ounce of nuts and seeds a day, to be eaten with meals. Since there has been so much contention among these plant-based doctors over whether or not to eat nuts and seeds, and if so, how many, and since he is the one who champions eating them most openly, I wanted to see what that added up to in literal terms like slices, actual nuts, and measured out teaspoons of nut butter or ground seed. It isn’t much, is it? And it’s sad to me to think of all the fuss there’s been over it. But it’s good to know for a literal woman like me what an ounce looks like, so I can be very careful about staying within it if I choose to eat some, especially if the chosen nut or seed is especially high in saturated fat. Dr. Barnard says in his book Power Foods for the Brain, if you’re going to eat nuts, eat almonds because their fat composition is best for the brain. And with my particular health challenges, I’m all about helping my brain along. On a less scientific note, the famous clairvoyant Edgar Cayce is said to have said, “Two almonds a day keeps cancer away.” Two. That’s not much either, is it? Now that you have an idea what an ounce looks like, if you choose to imbibe, how will you spend your ounce? Chop or tear up your favorite greens in a salad bowl. 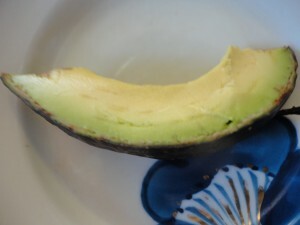 Cut one modest slice of avocado—no more than an eighth of the whole fruit. Chop the slice and distribute on top of the greens. Splash with lemon or lime juice. Now this is where it gets fun. Become the incarnation of my grandmother’s friend Jo Micelli or any of my other Italian relatives, and squish and mash the avocado, citrus, and garlic into the greens with both hands. Enjoy yourself. Wash your hands before, and lick them after, then wash them again. Your greens are dressed, and ready for anything else you might want to add for color and texture. Just an additional splash or citrus or vinegar or extra herbs and spices over the top of those and you’ve got yourself a salad. Love it !!! Bless you, my dear sweet one. Thank you for posting today’s message. It’s interesting that even though portion sizes are listed on most everything we buy these days, few actually read them and even fewer follow them. It’s like we automatically think: oh, they aren’t talking about me so I’m going to enjoy as much as I want! I, too, am very literal with most all things (just ask my husband!) and I’m also quite visual so the pictures you provided were much appreciated. 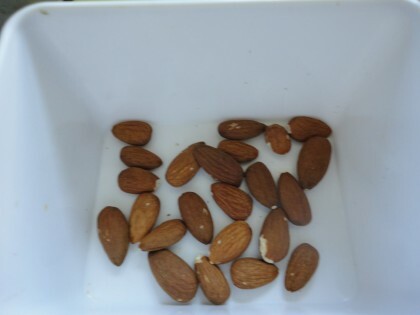 I even found myself counting the ounce of almonds! Thank you for the lovely recipe. I’m going to try it today! Hi Marcia, and thanks for this wonderful feedback. From one literalist to another, I loved that you counted the almonds! I’ve tried to, but then can’t remember where I started. They all look the same! LOL I hope you enjoy the easiest avocado dressing in the world. I’ve been “making” it a lot this Summer. Thanks for the visuals! I am quite literal, too – it is nice to know I am not alone, LOL – and also quite visual; I love being able to “eyeball” things, but ballpark ounce-measuring is pretty darn hard! Love the salad dressing idea! 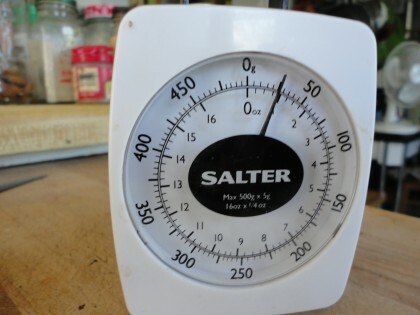 Dr Swank recommends 20 grams of fat…I did not know that precise number, I am glad I do now. In keeping with being literal, I have a question: Did Dr Swank mean grams of foods with fats? Or grams of fat in foods? I looked in the CRON-O-METER, and 28.3 grams of sesame seeds (28.3 grams= 1 ounce, more or less) has 14.1 grams of fat. So an ounce of sesame seeds, for example, would keep you well below the 20 gram max Dr Swank recommended, right? Sorry to be so nerdy!! I am trying to help a friend with MS with diet and I want to be sure i am getting it right. Thanks so much for this post. As I get farther along in following the McDougall plan, I’ve been realizing that it is time to refine and pay more attention to fats. I’m likely at the high end of teh Swank recommendations, maybe a tad over. This post came at a great time for me. I can also be quite literal. I’m wondering if you can do another conversion for me. 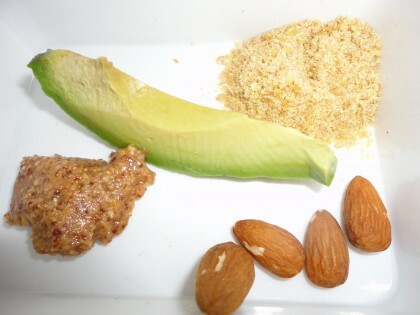 For your pictures where you show 1 oz of fat (both the yummy combo of foods, plus the one with 1 oz of almonds), how many grams of fat would that be? Does that keep you right at about 20? I’m just finishing up Dr. Barnard’s book “Power Foods for the Brain” so I guess it is time to re-read the Swank book, and also “Overcoming Multiple Sclerosis” from Jelinek. Thanks, Pam! I’m glad my post came at a good time for you. To answer your conversion question, in The Mulitple Sclerosis Diet Book (which you really must own! :)) on page 119, Dr. Swank gives a list of conversions of measurements that translate into grams of fat. For instance, one teaspoon of oil equal 5 grams of fat. Two teaspoons of nut better equal five grams of fat. 1/2 ounce of almonds equals 5 grams of fat. 1 Tablespoon of seeds equals 5 grams of fat. I don’t use a more high tech measurement system like the cron-ometer, but it looks like from Nicole’s comment that Dr. Swank’s conversions jibe closely enough with it, too. So, if a half ounce of almonds equals 5 grams of fat, the shot of the almonds in my post would convert to 10 grams, half of the 20 gram allotment. The “combo” shot adds up to between 10 and 15 grams probably. So both things are within that 20 gram allotment of Dr. Swank’s. Hope this helps. I really enjoyed this post for a number of reasons. I will try the dressing tonight as I love the simplicity and it sounds perfect to me. It made me laugh because it reminded me of myself. I am a very literal person as well. It made me remember something that happened long ago. Upsetting at the time, but funny now. I was freshly out of drivers ed and going for my drivers test. The man giving me the test told me to take the next right and being the very literal person that I am followed his directions. I took the next right and pulled into someones driveway. Ha Ha Needless to say I didn’t get my license on my first try. Thanks for the recipe and the laugh. I really needed it! Oh, never give up, so glad you enjoyed this post. And thanks for sharing this!! YOu had ME laughing out loud for nearly a full minute! I would have at least seriously considered whether I should do that, too!! So nice to be able to laugh about it now, yes?? Here’s to happiness for the literal minded!! Previous post: Let’s Do Lunch?